Enjoy the best of both worlds with a luxury accommodated mobile safari; an opportunity to gain an insight into areas and wildlife not necessarily available to guests on a typical fly-in safari. Experience a 10-night/11-day itinerary through many of Botswana’s most iconic areas, where a professional guide will provide a unique and personal insight into the wonders of these wilderness destinations. Rooms each sleep two people. Each spacious timber and thatch chalet or luxury African safari-style tent is raised on a teak platform and features an en-suite bathroom and a private wooden viewing deck. 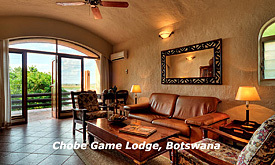 In addition, Chobe Game Lodge is fully air-conditioned and each room has a river-facing terrace or balcony and a complimentary mini-bar. With a maximum of six participants, guests are assured of attentive service at all times and will travel in fully equipped and customised luxury safari vehicles. Private activities are tailored according to the group’s requirements. 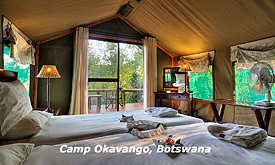 Depending on the area’s ecosystem, these include open-vehicle game drives, guided nature walks and exploring the Okavango Delta by mokoro, a traditional dugout canoe. 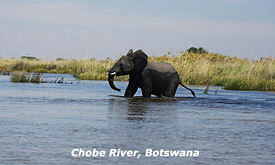 Other activities include seasonal fishing, motor-boat sundowners and Chobe River cruises. During your mobile safari you will witness the dramatic scenery of Botswana’s national parks and game reserves, while the many different ecosystems you will pass through are home to a wide variety of wildlife, and a kaleidoscope of birdlife.  All meals from arrival at Chobe Game Lodge on Day 1 to departure from Leroo La Tau on Day 11. 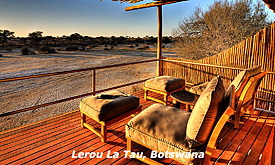  The services of a professional guide for the duration of the safari from arrival at Chobe Game Lodge to departure from Leroo La Tau as per itinerary.  Private activities for the duration of the safari. ** No Children under 16 years old on scheduled departures.